The Mont Pourri Gite (named after the nearby 3,779m peak) is a charming Sainte Foy chalet apartment with traditional picturesque views from its private terrace. It is perfect for a family or group of four to seven looking for a cosy ‘home from home’ setting. The accommodation is set on one floor, making it particularly suitable for toddlers or younger children. The heart and soul of the chalet is the rustic open plan living area including kitchen, dining and sitting room with hand-built wooden ceiling and log burning fire place. Bedroom 1:A large “master suite” room, with king-sized bed, access to joint bathroom with bath & WC next to bedroom; Double French doors onto large terrace overlooking the Isere Valley region (overall area 18 m²). Bedroom 2: Twin beds (can be arranged as super-king size double) with access to joint bathroom with bath and WC located across the corridor (overall area 13 m²). 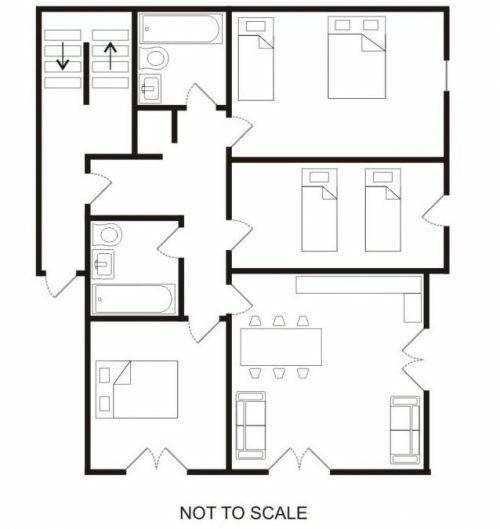 Bedroom 3: Large family sized room, usually set up with two single beds bed (can be arranged as super king size double) an additional single bed, cot or bunk bed can be provided if required; access to bathroom with bath & WC located next to bedroom (overall area 18 m²). The Mont Pourri has a private ski locker. Your Venture Ski spa and swimming pool is accessed just a few metres from the door, across the drive. The chalet is close to creche and childcare facilities. Babysitting services are also available. In the peaceful area of La Bataillette; Mont Pourri is a five-minute walk from the resort centre where there are shops, local restaurants and bars, ski schools, nursery slopes and the main ski lift. Even closer to hand is the Black Diamond Lodge Restaurant and Apres-ski bar. Mont Pourri is offered self-catered, but our Concierge team can deliver daily fresh breakfast supplies and we also offer a pre-booked dinner option at Black Diamond Lodge restaurant for any or all nights of your stay. You can book in at the restaurant on an ad-hoc basis during your holiday of course.